The front facing camera on the Kindle Fire HD is for Skype video calls. But there’s no camera app in its interface — it’s hidden. Here’s how to find it. The Kindle Fire HD has a front-facing camera that’s meant to be used for video calls using Skype. But there’s not an obvious way to use it to take pictures or record personal videos. Here’s how to find and use the hidden camera app for video, pictures, and even panoramic photos. Editor Update: This article was written using the first generation of Kindle Fire HD — not the current versions and not the HDX or higher. There’s a new version of Android and Amazon has changed things around with it’s heavily customized forked version of it. First you’ll need to install ES File Explorer to the Fire HD. 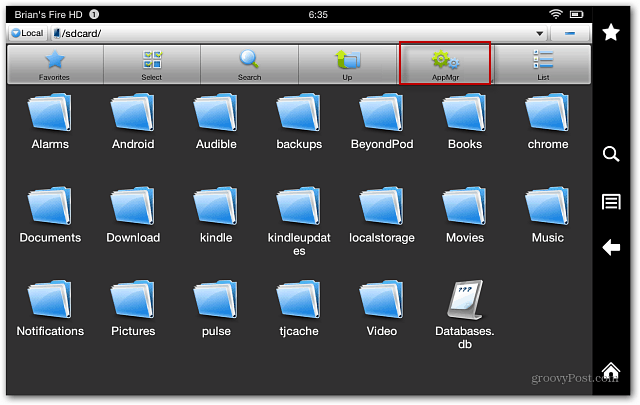 There are other apps to find files hidden under Amazon’s customized Android 4.0, but I find this one to be easy to use and it’s free. Plus you can download it from the Amazon App Store. Launch ES File Explorer and tap AppMgr at the top. On the next screen tap Category. The Select Types windows come up, tap System Apps. 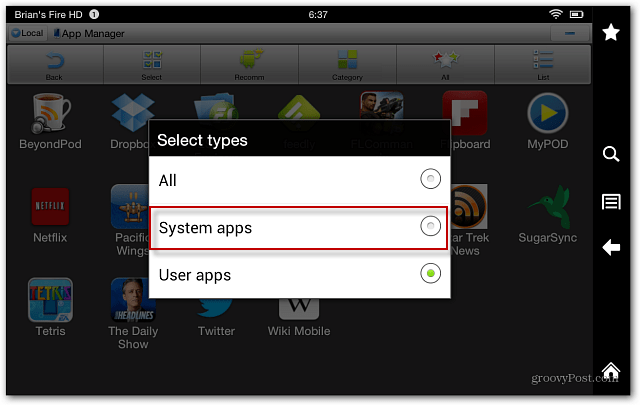 This will list all of the Kindle Fire HD system apps. Select the Camera icon. The Camera app opens and you can start taking pictures, videos, and panoramic shots. It includes different effects, a zoom dial, and other settings. 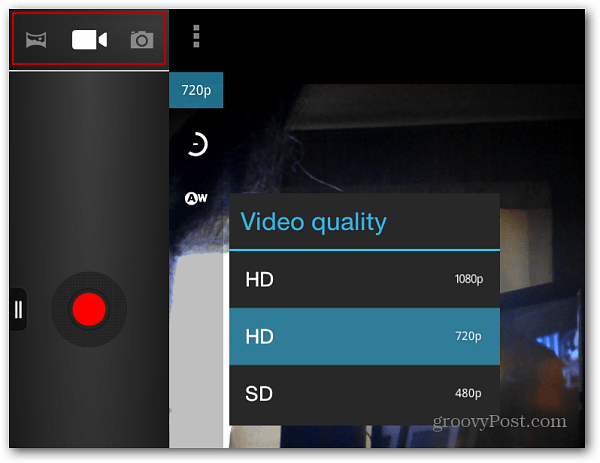 Here’s an example of selecting video quality settings – up to 1080p. After you take your picture or video, you can access it from the Photos on your device. 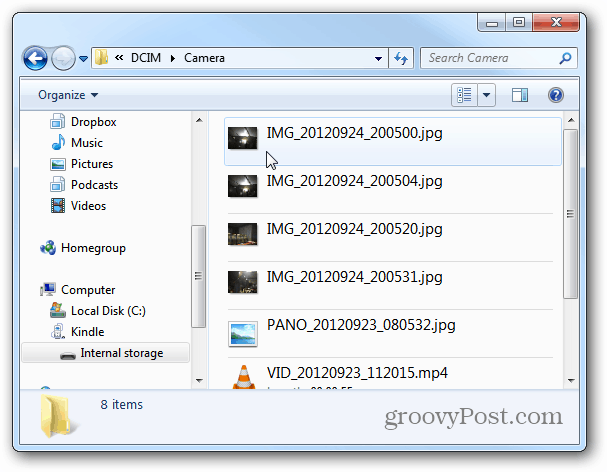 Or, connect the tablet to your computer and browse to the DCIM folder then Camera. Taking shots from a from a front facing camera isn’t practical, though, and there isn’t a way to create a shortcut to the app. 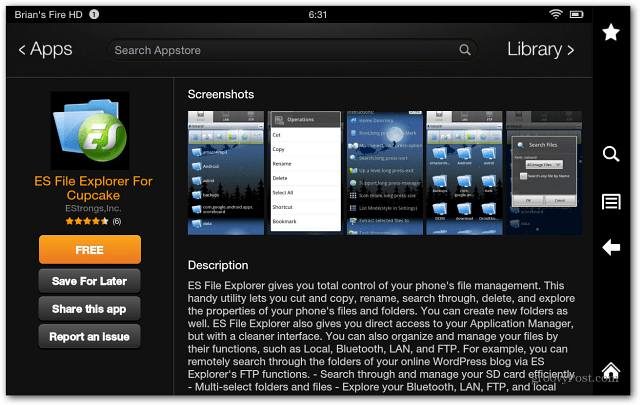 You’ll need to go into ES File Explorer each time to access it. Nice find, thanks, but why in the world would Amazon release their new tablets without easily accessible camera apps? I mean, I know the quality isn’t great, and that it isn’t practical, but the video is certainly good enough quality for simple vlogging, etc when you don’t have a nicer camera or if you’re on location somewhere. I just don’t get it. Indeed. Very surprised they hid the camera app. Doesn’t make sense. I just put the ES File Explorer as a favorite. Then all I have to do is tap on it and then the camera icon. It’s a work around solution but an easy one. You can’t do video that way, only snapshots. Thankyou Mia!!! And Thankyou Brian. If one doesn’t work I’ll try the other. You’re both wonderful! @Peg thanks! Glad to have helped! Thanks for the info. It is an easy way to access the camera. For video,which is less seldom, we can do it the ES way. Very helpful post. What version of the Kindle were you using to find that camera icon? I just touched and hold onto the camera icon, and unexpectedly, a menu appeared. I chose create shortcut, and now I do have camera icon on main menu. Try it. Great michelle! I was surprised that it does Panoramas! Not sure why the feature is buried. I agree, I would like to see a shortcut added or at least the ability to create one in a future update. I can’t make it work, Grrr… there is no catagory field to click on. Any sugguestions? There’s no Category button in ES File Explorer after you tap AppMgr? When I open the ES file explorer, I see the list of folders, like your screen shot, and the choices up top, however my button where your AppMgr is listed only has a ? with a circle around it. If I press the button, I get a list of instructions and I can’t select any of them. Wow, that is weird. I would reinstall it first and see if that works, if not, maybe reset it back to factory settings and install it again? 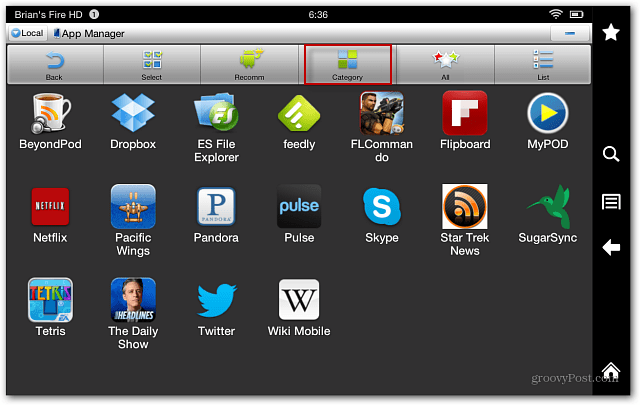 Another thing you can do it try a different file exploring app like AndroXplorer — I haven’t used any of them other than ES Explorer. When I try to run the camera I get an error: “Can’t connect to the camera” but when running Skype the camera works fine. Any idea? I just followed your steps and am pleased to be able to take pics with kindle fire hd. This is so cool, thank you. Hi David, welcome to groovyPost! We’re glad the tip helped you with your Kindle Fire. Thanks for stopping by and for the comment. So what do you think of the Kindle Fire overall? Did you have the original Kindle Fire or is this your first step with one? Awesome – and easy with your step-by-step instructions. Thanks so much for posting. I have a new Fire HD and had no problems with getting it to work or accessing the photos. When trying to launch the camera via Facebook or es file manager method I get a “camera has stopped” message any solutions? dear David: just managed to get my kindle fire hd 8.9 to work with the camera only to find that it doesn’t come in 1080p HD when i clicked on 720p, the only options are 720p HD and 480p SD…do you think the manufacturer sent me a wrong version or am i doing something wrong or maybe i thought i was buying 1080p HD one but actually bought 720 HD? i just got it yesterday. thanks! my receipt said “Kindle Fire HD 8.9”, Dolby Audio, Dual-Band Wi-Fi, 16GB. but, when i looked at the device it said, 13GB. where did the other 3 GB go? i am clueless with these things and before i get in touch with customer service about this issue, i hope maybe you can help me out by explaining to me if there is any difference with say, the original kindle fire. with my impression of searching the net, it seems those that uploaded information have 1080p HD option while mine doesn’t and I thought I have the latest kindle fire, yet. thanks once again for your time and response. Perhaps the android os takes 3 gb. I did the same as David and now I can use the camera :). Thank you so much :). same happened to me! what do you mean by clear data? That might be because Amazon releases automatic updates over the air. When that happens, it often breaks hacks and definitely rooting the device. I don’t seem to have that little camera option any help please? Is this only possible on the Kindle Fire HD and not the regular Kindle Fire – or do both offer this hidden feature? Just the Fire HD, the original and revamped one doesn’t have a camera. Latisha Hawn You need to install ES File Explorer first. It’s free. And once you have that installed, just follow the steps in the article and you’re good to go! Hi, I followed all directions, found the camera, but am still getting the cannot connect to camera error message. I created a shortcut and it’s on the right side when I open the photos tab… thanks for info! Have downloaded the app,but the camera is still front facing,what have I done wrong please? @debbateman:disqus The software doesn’t allow the camera to shoot via rear-facing. The Fire HD only has a front facing camera. Many thanks Brian.I was doing all the right things all along.Hope that Amazon eventually bring out a kindle fire hd that takes pictures both ways. I cant skype, the camera doesnt connect or something, i have a camera it just shows black and i cant see the person im trying to skype. help pleeease!!! My Kindle Fire HD was saying “can’t connect to camera” also, but what I realized is that it only does it when my battery is low. This was great information,but I did a couple of trial videos, how do I delete them? I had over 200 photos photos on my kindle hd using the built in kindle camera as well as another camera app. It seems as though there was a kindle update and now I can’t find any of the photos. The updated camera is not responding neither is the built in camera. Skype is also not responding. Are there any suggestions for recovering my photos. I found out that many people had the same problem as of me of taking pictures and videos on kindle fire HD. This article is really helpful as I used ES file explorer and no wonder its a great app but still I would say that ES file explorer don’t allow the optimum camera usability. Considering that fact, I searched amazon appstore for some camera apps installed few but was disappointed. Finally downloaded this app named myCamera HD+ the best thing about this is you can edit your images and share them unlike other apps.I wanted to share my experience as you can not easily find useful apps among thousands of apps especially when most of them are paid. I’m so confused and disappointed with mt Kindle Fire HD. What’s up with a front-facing camera? I can’t even see what I’m taking a picture of. Makes no sense to me. Am I doing this wrong? I have the kindle fire hd & the camera thing didn’t show up. So what now? This article was written using last years Fire HD. I will be looking in to the problem with the HDX and will update the article accordingly. Stay Tuned! Same with me. Is there a diff way with kindle hdx for camera download? I’m really annoyed I’m on the system apps but a camera icon idiot appearing really need help please anyone….. The Kindle Fire HDX only takes front face pics & video, correct?? Correct, so does that mean I cant take regular pictures or videso?